In the Central American nation of San Sebastian, a group of violent rebels kidnap the American Ambassador, Ambassador Porter Worthington (Carreon). (You know he’s American because his name is Porter Worthington, so don’t think he was played by a non-American actor). The leader of the group is Hernandez (Diaz), who sports some intimidating facial hair and has unpredictable taste in hats. He wants the release of the prisoner Isidro Zapien (Gamboa) and will use entire armies of armed men to achieve his goal. Naturally, the one man who can rescue the Ambassador and save the country is Vietnam vet Steve Parrish (Marchini). 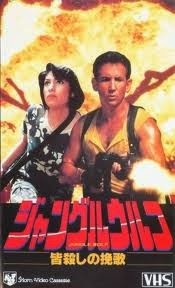 He teams up with the beautiful Maria (Abeyta) and heads off into the jungle to fight the baddies. But he’s haunted by the ghosts of his past, especially as they relate to Forgotten Warrior (1986). Will he succeed? Confusingly, Jungle Wolf uses a lot of recycled footage from the aforementioned Forgotten Warrior, but both movies were released the same year, 1986. Seeing as how Ron has the same yellow shirt in both movies, it’s safe to assume they were shot simultaneously, or at least very close together. This seems to be the beginning of his Steve Parrish character, who he played in at least four of his films. His son Zak (Nicholas) makes a brief appearance here, but the plot of Jungle Wolf II (AKA Return Fire, 1988) fleshes out the relationship a bit more. But technical details aside, Jungle Wolf takes the standard El Presidente/Jungle Slog so common in the 80’s, and gives it the old Marchini magic. The movie is almost plotless and could be described as incoherent. But it’s incoherent in a great way. As there seems to be no word to convey this idea, we’ll pioneer a new one, grincoherent. We’re not sure if the grincoherence is helped or hurt by Marchini’s unnecessary and deadpan narration, the character of Agent Connover (Vance) who looks exactly like Rick Moranis, and of course the constant machine gun shooting. The highlight of the movie is the fist-pumping song “Back In Action” by Michael Bristow (a frequent Marchini collaborator who has worked with him in various guises both in front of and behind the camera). It sounds like a cross between Europe and the Scorpions, which is funny because as far as we know Bristow is American and the song was recorded in California. But that doesn’t stop Bristow from singing with a Klaus Meine-like accent. You gotta love it. When the song plays while Marchini changes into his all-black outfit (complete with horizontal pant-leg zippers) and gears up with guns and knives, you’ll be in action movie heaven. Thankfully it happens twice in the movie. Why the movie is set in Central America but was shot in the Philippines remains unknown, and sadly this particular Marchini outing was not released in America. Fans in the Netherlands got to enjoy it, and it wasn’t until the advent of the internet that others could complete their Marchini collections. It was also the only Romarc movie not to be released here in the U.S. (that’s Marchini’s company, the word being a contraction of his first and last names). 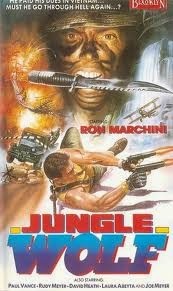 Lovers of low-budget and/or obscure action from the 80’s, and of course Mr. Marchini, will likely get a charge out of Jungle Wolf. For casual viewers, it may be better to start elsewhere.